Hey ya'll! 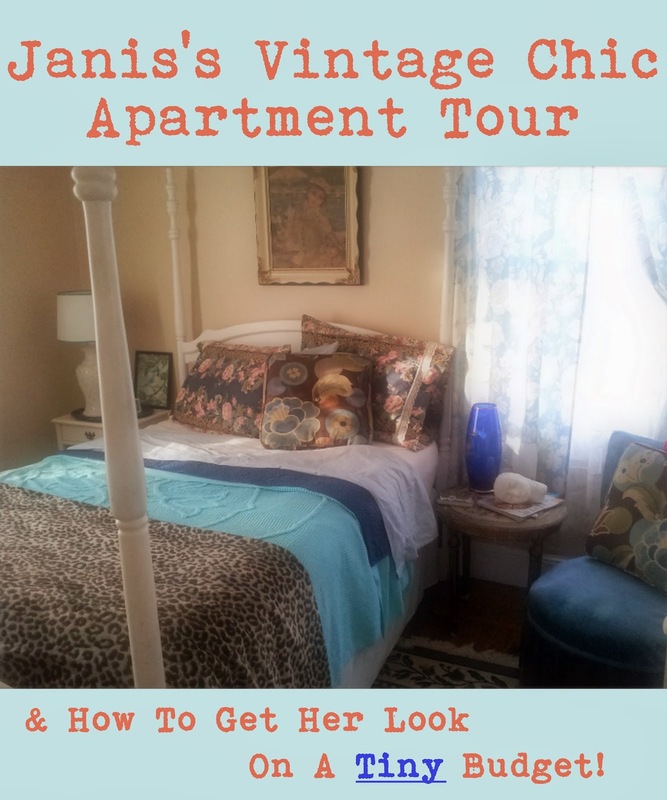 I'm back with another peek into my lovely Auntie's fab vintage apartment. I had planned on sharing a few more posts between the last part and this one, but life got in the way, so here we are. 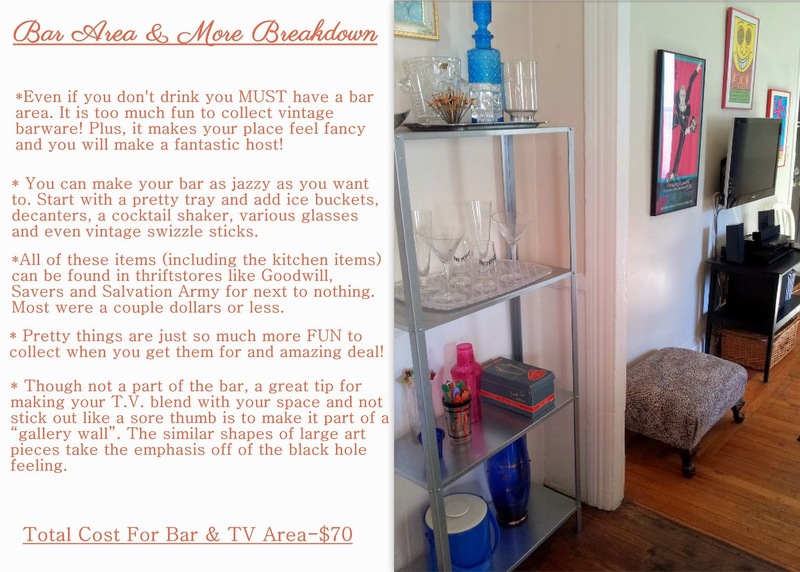 Some more ultra cheap and sometimes free decorating ideas and inspiration comin at cha... Enjoy! If you read Part One & Two then you remember that I gave the entire apartment a fresh coat of this brightening yet neutral grey color. It's the perfect backdrop to make all of my vintage pieces look a little more modern and fresh. 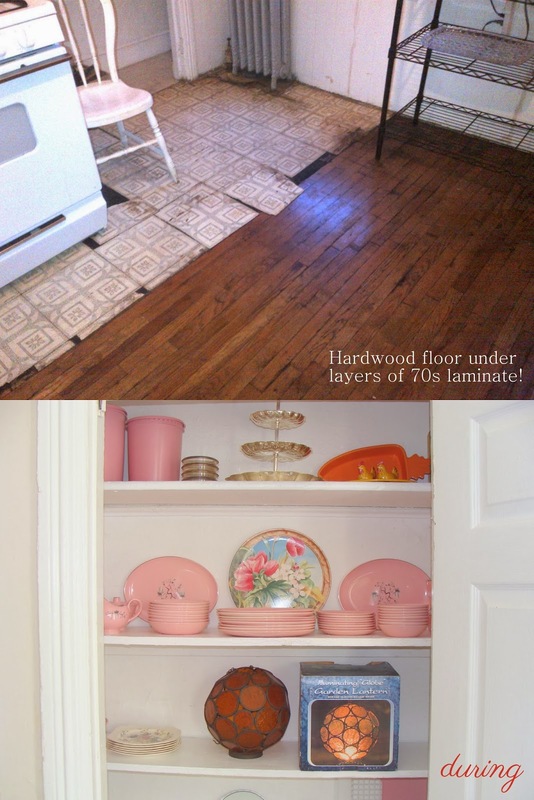 The original wood floors got a good cleaning and they came out just gorgeous! When it came to buying curtains for these very tall windows it could of got pretty darn expensive, even shopping at the more affordable big box stores. I wanted a sheer set under an opaque set so I had the option of filtering light and the view, as well as blocking it out completely. Enter Savers thrift store. Or any thrift store with a good textiles section. Curtains average about $3-$5 a pair, making this a MUCH cheaper option! So what would have cost $150 and up- ended up costing me $15. Gotta love it. 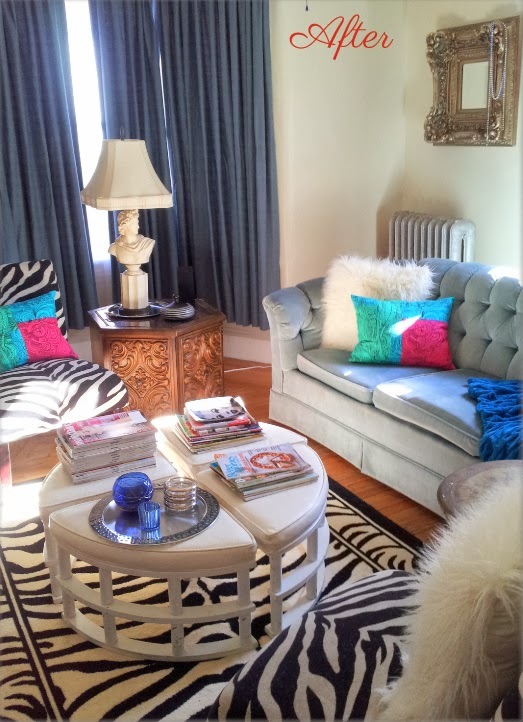 I just realized that my entire living room cost less than most people pay for a sofa :) Awesome right? 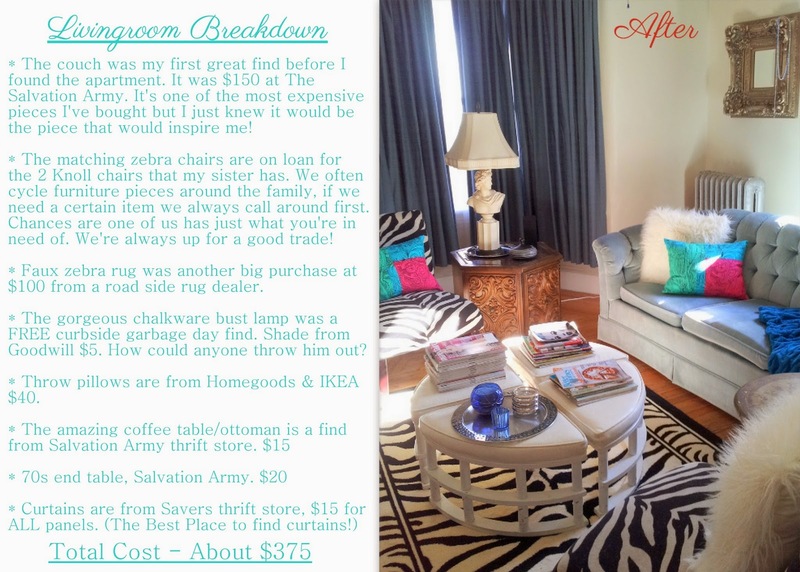 And nothing was purchased new besides the rug and throw pillows, making this a VERY environmentally friendly & pocket book friendly home decorating job. Also, here's a good tip if you are feeling a bit squeamish about buying second hand upholstered pieces. You can give them a deep cleaning by renting a carpet cleaner with upholstery/rug attachment. They do an excellent cleaning for about $20 per day. And you can even make your own cleaning solution by combining hot water, vinegar and a couple drops of essential oil for a fresh scent. I would test a spot to make sure your piece is colorfast first. 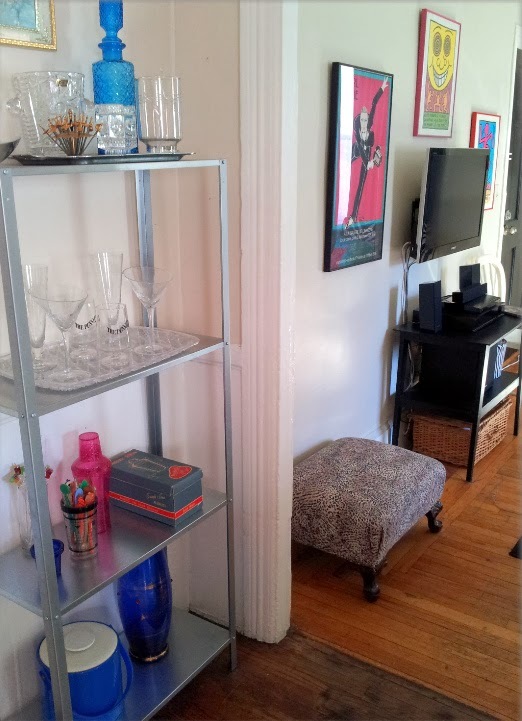 My entryway was very tight and had no space to add much in the way of decor or furniture. I added some much needed drama by painting the doors black (which also covered some ugly cracks). 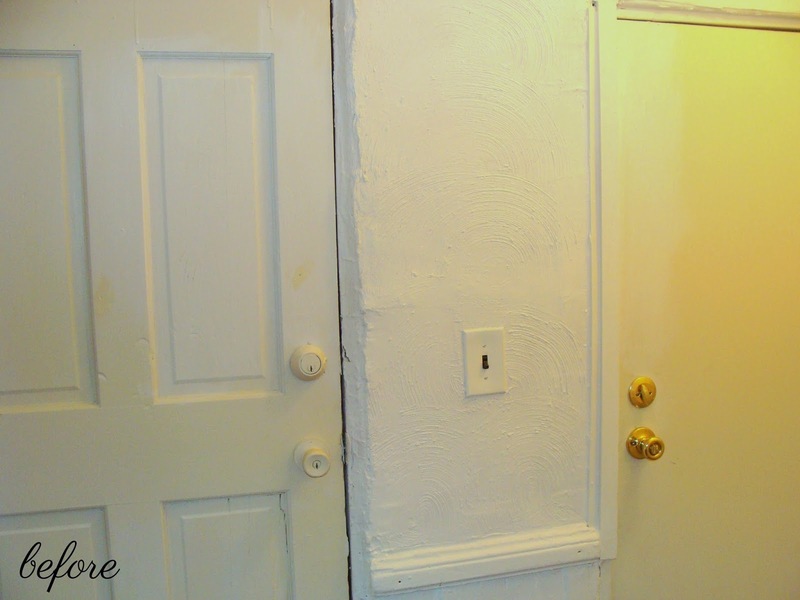 You'd be surprised by how much of a difference you can make in a space simply by painting the often overlooked interior doors. 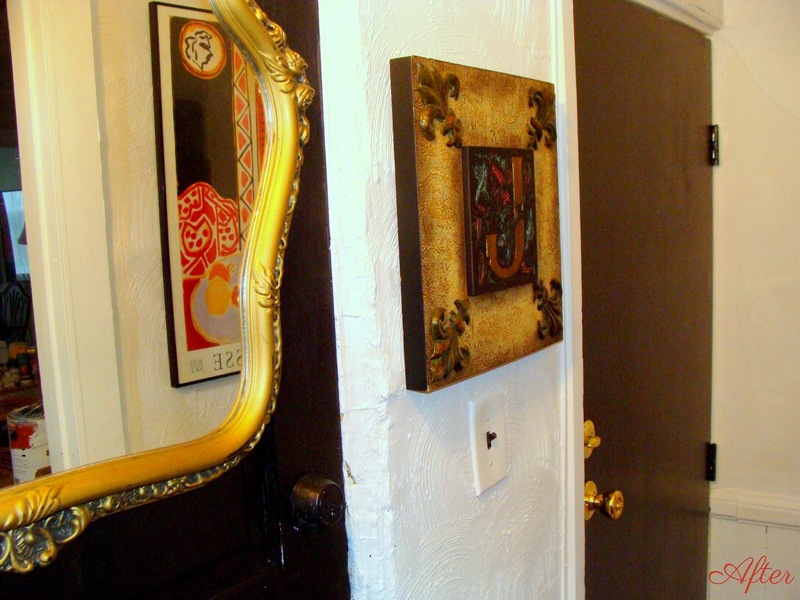 I also hung a mirror on one of the doors to visually open up the cramped space. I know it seems like a faux pas to hang anything on a door but it can work if you have a solid door and hang the piece securely. The entryway cost about 20 bucks in total and really makes a statement when you come in the door! Coming next week will be the fourth and final part of the tour! See you then! As I said in Part One my apartment had loads of potential that wasn't yet visible under layers of dirt, dingy paint and awful linoleum floors. 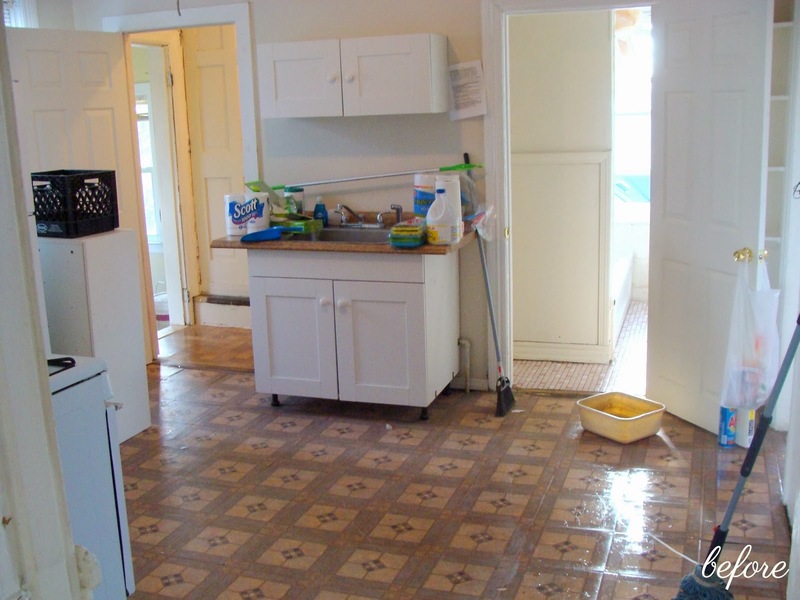 I gave the kitchen a very deep cleaning and a fresh coat of paint. Then I got down to the nightmare job of ripping up all the ugly flooring to expose the gorgeous honey colored wood floors under them. It was a back breaking job but was it was so worth it! 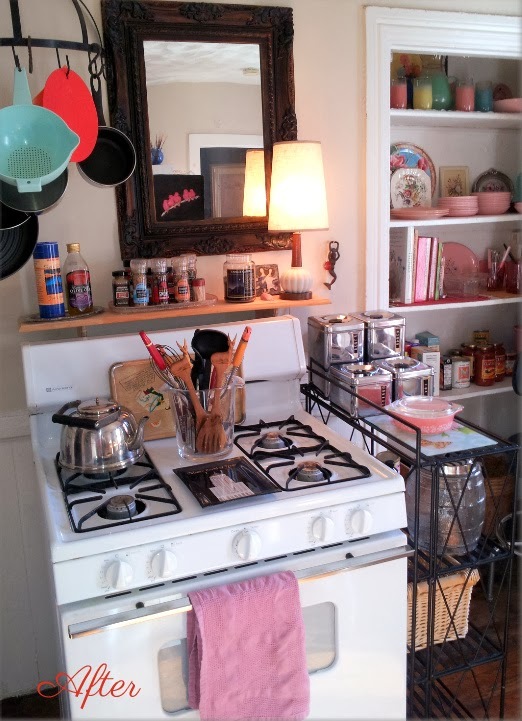 When it was all said and done, I had a cute and clean kitchen with some darling vintage character. Even though I am renting it is worth all of the work for my piece of mind. Your home is your oasis, no matter where it is. 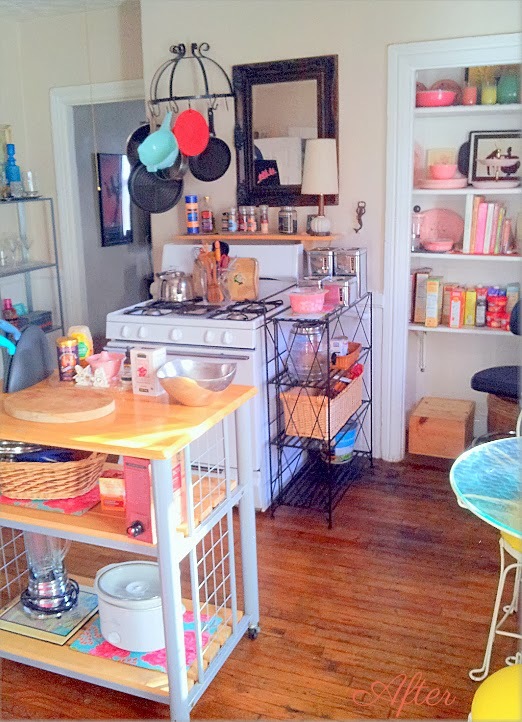 Then came the FUN part, collecting vintage kitchen ware and decor. 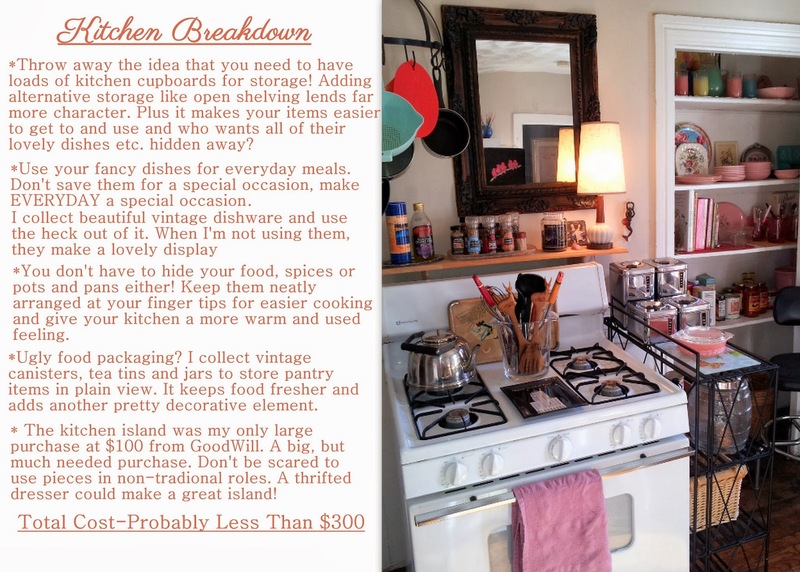 Vintage cookware is not only pretty but most of it is far more sturdy and safe for cooking than new pieces. Just think, if vintage Pyrex dishes have lasted 60 years by the time you buy them at the thrift store/estate sale etc., they will probably last another 60 years! In times past, things were made to last and take a beating, unlike the poorly made and often toxic plastic junk you can buy now. Not everything vintage is food safe though, so be sure to do your research before you use old pottery or anything suspect to serve or store food with. 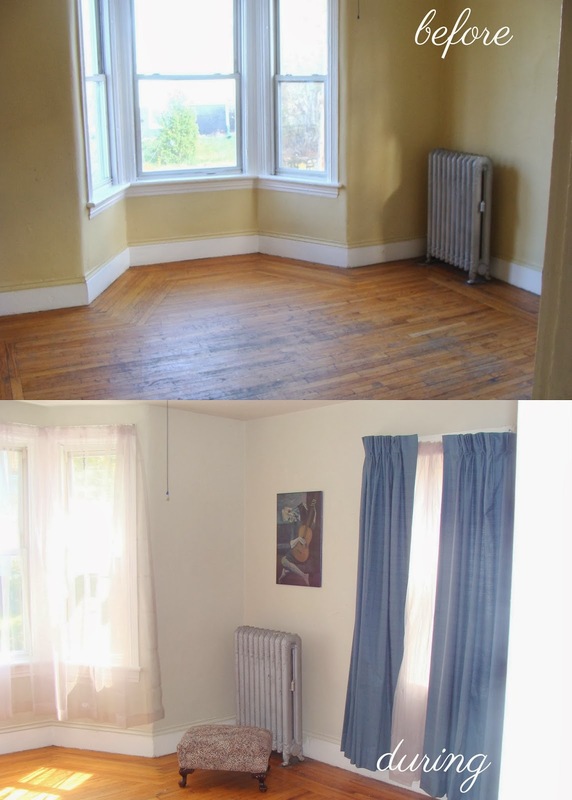 All of these old Providence apartment kitchens come with an open space, gas stove and few or no kitchen cabinets. With that in mind I didn't pass up on a single sturdy storage piece or shelving while searching the thrift stores. I knew I would find a use for them. Another item I NEVER pass up in thrift stores is vintage or antique mirrors. You will always find a place for them, and they help to brighten your space by reflecting light and adding character. Okay! That is the end of Part Two. See ya'll back here next week with Part 3 - The Bedroom and Bathroom. Hope you are finding inspiration and ideas for your own spaces and maybe even checking out garbage day in your neighborhood ;) Drive Slow! Do ya'll have any tips for thrifting and/or decorating on a tiny budget? I'd love to hear your ideas in the comments below! In the dark months of Winter our bodies' immune systems struggle to maintain optimum health. Especially those of you in Northern Climes (I feel for you right now ya'll. I know all too well how brutal these final weeks of cold, grey days are). Vitamin packed fruits and veggies are just what our bodies need for a rejuvenating boost and this fresh Organic juice recipe does just that. This is my Go To Winter juice recipe. I find myself craving it's refreshing, invigorating flavor and make a small jug at least once a week. The ingredients are affordable and I always have them on hand, so I replaced my carton of store bought orange juice with this instead. Not to mention store bought orange juices contain nasty "flavor packs" of chemical flavoring to maintain a consistent taste even though oranges can vary in sweetness/tartness throughout the year. Yuck. The pasteurization process also removes key vitamins our bodies need, so you end up losing most of the benefits that should be found in a glass of natural juice. I also want to note that my husband and I don't own a crazy expensive juicer. We just don't think it's necessary to buy a $500 juicer. Maybe if we owned one we would feel differently but for now our $100 Breville Juicer does a spectacular job. It's very compact, so it fits in our small kitchen and it's quick and easy to clean. Which is awesome cuz ain't nobody got time for that. Not with a very busy 5 month old baby anyway. I mean we need to spend hours walking around the house holding her up to the art on the walls/curtains/plants/very patient dog etc. so she can see and touch them with her chubby little learning fingers. Priorities. Also we get to use the remaining pulp to feed the worms in our indoor composting system. Which in turn creates compost "tea" that we can feed to help the plants and herbs in our little patio garden thrive. Everything comes full circle and nothing is wasted. And we have a little urban homestead to be proud of. Everyone wins, even the worms. *A nice chuck of fresh Ginger Root (about an inch long should do it). That's it! Make sure all of your produce is Organic if possible to avoid scary chemicals and give everything a good scrub first. Toss it all in there and Viola! Deliciousness. I store mine in the lovely little jar you see above that I found in a thrift store for 99 cents. They are a common thrift find and work perfect for juice. This juice will only last about 4 days in the fridge at the most, as it is all natural, but it's highly unlikely it will ever last long enough to go bad. It's that addictive. The smell alone is amazing. There ya' go! Go and make it, I promise you'll feel a little better :) If you don't have a juicer, chop it all up and throw it all in a blender and add some filtered water or almond milk to get it moving. Core your apples, peel your oranges and ginger and trim your carrots first but other wise you will get a just as uplifting and yummy concoction that your body will thank you for! Spring Is Coming Guys. It will be here before you know it. In the meantime light your candles & incense, play some reggae, buy yourself some bright colored flowers and make some juice!